The location-aware AroundMe helps you find nearby businesses and services—think banks, restaurants, gas stations, hotels, hospitals, and similar establishments. 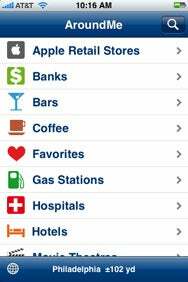 Tweakersoft’s free app does this by tapping into the location features in Apple’s mobile devices. In The Neighborhood: One of AroundMe’s strengths is the vast number of different types of businesses it can find in your immediate vicinity. In the case of the iPhone 3G, that means the built-in GPS capabilities. While AroundMe claims support for the iPod touch, Tweakersoft points out that touch users should not expect the same kind of accuracy as they might get with a GPS-enable device. But even on an iPhone 3G, I occasionally encountered some outdated information—businesses weren’t where AroundMe said they were. Maybe the businesses relocated or went out of business—a distinct possibility in this economy—but it still made me wonder about the precision of the app’s data. A traveler using this app in an unfamiliar city—really, AroundMe’s target user—should take its search results with a grain of salt. That said, AroundMe is simple to use and produces results fast. It’s a serviceable finder app, though it doesn’t do anything particularly ground-breaking. Since other apps offering more specialized searches can clutter up your home screen, AroundMe can consolidate those searches into a single free app. Still, after spending some time with AroundMe, I continue to prefer uLocate Communications’ Where, which matches AroundMe’s free price tag while offering a sleeker interface, Yelp integration, and more accurate search results. AroundMe is compatible with any iPhone or iPod touch running the iPhone 2.2 software update.